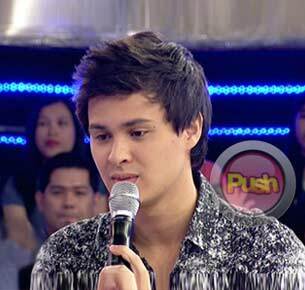 Matteo Guidicelli admits that he hopes that they have a long and lasting relationship. Despite the fact that they’ve admitted to dating for over a year now, persistent rumors of an impending breakup keep hounding Matteo Guidicelli’s relationship with Maja Salvador. The My Binondo Girl actor shrugged off these issues and clarified that his relationship with Maja is going strong and that she is the only girl in his life. “Yes for me my heart is sure but you never know what’s going to happen for tomorrow. God only knows that. Basta sinasabi ko kapag may love diyan, ipaglaban natin itong mahal natin,” he shared. The Fil-Italian heartthrob revealed that his parents have already met Maja. “Oo naman. Masaya actually. They think she’s a very nice person. Sa umpisa iniisip nila kasi taga-showbiz siya pero when they got to know her naging okay naman lahat,” he shared. Matteo also admitted he had no problem meeting Maja’s mom last year. “Si tita Thelma sobrang bait niya,” he added. Meanwhile, the 22-year-old actor shared his most memorable moments while working on My Binondo Girl. The series will air its final episode on January 20. “Madami naman. Yung Hong Kong trip namin nung pumunta kami sa Hong Kong nung first month of taping. Memorable yun kasi nakapag-bonding kaming lahat dun. Talagang we got to spend time with each other. Actually kahit yung mga every day taping namin, we get to know each other a little bit better. Asar-asaran, kantwayan, tawanan,” he said. Matteo also shared that apart from his showbiz projects, he was involved in helping less fortunate kababayans in his hometown. “Last year may mga konti-konting mga charities akong tinulungan especially sa Cebu kasi may mga maliliit na foundation ako sa Cebu na I support,” he admitted. After My Binondo Girl ends its successful run with a dragon finale on on Friday, Matteo said he is already looking forward to his upcoming movie with Maja which will start showing next month. “Para sa mga fans namin, My Cactus Heart po, February 25 and of course maraming maraming salamat sa mga sumuporta ng My Binondo Girl. Thank you very much,” he said. Catch the My Binondo Girl dragon finale this Friday, January 20 on Primetime Bida. To get more updates on Matteo Guidicelli, log on daily to Push.com.ph and follow @Push_Mina on Twitter.